Many of you know Selden Lamoureux as one of our favorite classmates and long suffering (hee hee) wife of LaoMa! And, while we happily extend her many thanks for keeping out master alive and well, many of you may not know her true superpower! Selden is an exceptionally talented potter! Over the years, I've been blessed to add several of her pieces to my kitchen and life. Each time I use them, they give me so much joy that I had to spread her well kept secret! 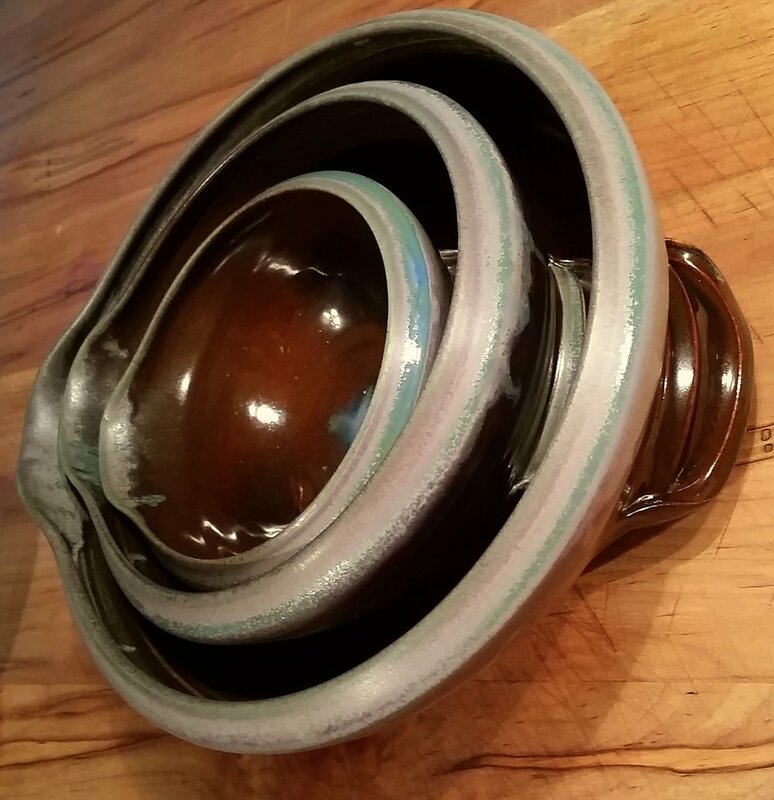 Earth Ox Pottery now has a website (https://www.seldenpottery.com/) that showcases her many creations. 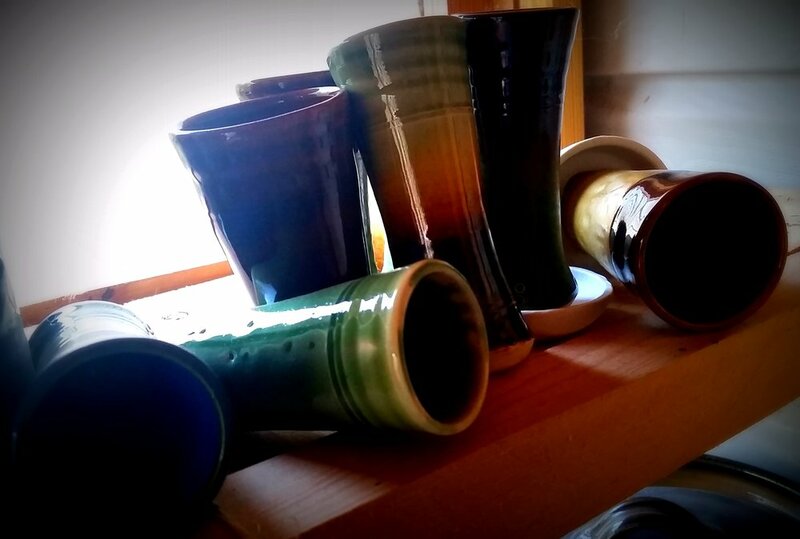 Take a gander at it; the holiday season is fast approaching and special handmade pottery is useful and functional! You can also link to her website from our navigation menu at the top of the page. (Warning... Violet gushing follows - to avoid just go look at pretty pictures on her website! To see her stuff in person, see the dates below or just talk to her next time you're out at the pavilion... or email her... she is part of the new digital age now). It's small pleasures that make our daily tasks feel like celebrations of life, friends and allow us to meditate on the joy around us. Her work reminds me of our shared labors of love and our common desire to have even our "menial" tasks bring smiles to our faces. Some of you may know about her bread bakers. They are beautiful and come with a fool proof artisan bread recipe! I've used it many mornings with guests because it's about the easiest (and most impressive) thing to do while drinking coffee! Plus, it's super easy to vary, adding rye, oatmeal or whole wheat depending on the mood! 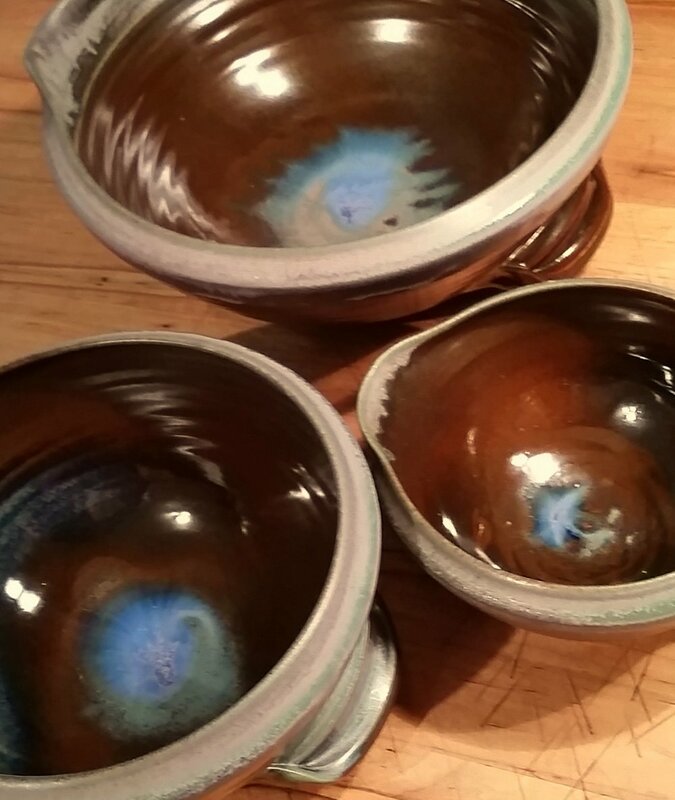 My latest love is a set of nesting bowls she's created. They have a clever handle, spout and lip that feel sooo well balanced in the hand. They're perfect for making and pouring pancakes or fritters, and I LOVE to see the color emerge again when they're all clean and shiny! When I got a set, I just left them on my counter for a couple days to admire them!! Duke Holiday Arts Invitational: During the holiday season, Duke Arts & Health curates a Holiday Arts & Craft Invitational within the Arts & Health Galleries located in the Concourse between Duke Hospital North and the Duke Medicine Pavilion. Our goal for this invitational is to highlight works by talented local and regional craftsmen and artists, and to offer staff, patients and families an opportunity to enjoy a delightful exhibit and ultimately purchase unique, quality items at relatively affordable prices during the holiday season.